What is Saturn’s atmosphere like? Saturn has hazy, yellow cloud-tops made primarily of crystallized ammonia. The clouds are swept into bands by fierce, easterly winds that have been clocked at more than 1,100 miles (1,800 kilometers) per hour at the equator. Saturn’s winds near its poles are much tamer. Also like Jupiter, powerful cyclonic storms appear on Saturn often. About every thirty years, for example, a massive storm forms that appears white. Known as the “Great White Spot”—even though it is not the same storm every time—it can be visible for up to a month, shining like a spotlight on the planet’s face, before it dissipates and stretches around the planet as a thick white stripe. This recurring storm is thought to be a result of the warming of Saturn’s atmosphere toward the end of the Saturnian summer, which causes ammonia deep inside the atmosphere to bubble up to the cloud-tops, only to be whipped around by the planet’s powerful winds. 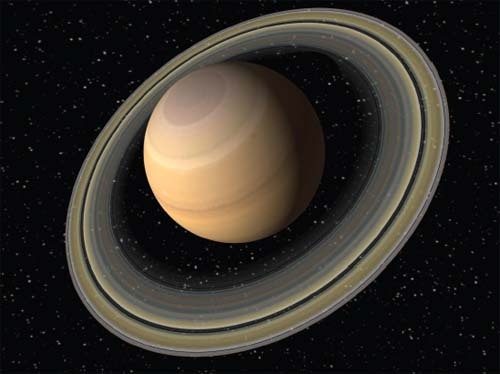 While only one-third the mass of Jupiter, Saturn is stunning with its spectacular ring display.